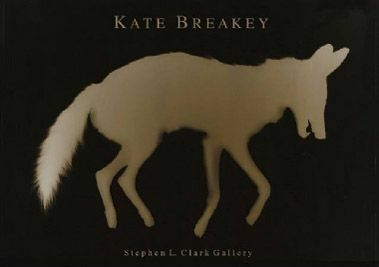 I ran in to Stephen Clark at the Lance Letscher opening and he said the hottest thing at AIPAD, The Association of International Art Dealers, in New York were Kate Breakey’s photograms. They were hung salon style and stopped people in their tracks. The Photograms were also presented salon style at the Stephen L. Clark Gallery in Austin last summer. Steve told his assistant Amber “that might be the best art wall I’ve ever seen” and encouraged her to sign the wall. Photograms were invented in the 1700s. No camera is involved in the process. The object is laid upon a photosensitive material (silver gelatin in this case). The light source (enlarger) is turned on and the image is rendered on the paper. All of the animals and plants Kate uses are found objects. According to Time Magazine, Anne Tucker is the foremost curator in the world. She is the curator of Photography at the Houston Museum of Fine Arts. Steve and Anne were discussing Houston’s Foto Fest at AIPAD in New York. Steve asked why no one has emerged from Foto Fest since Keith Carter? Ann pointed to the wall of media invented in the 1700s and said “Nobody is this fresh”. The Coyote is an edition of 3. The others are editions of 10. Even though they are editions, each is unique. 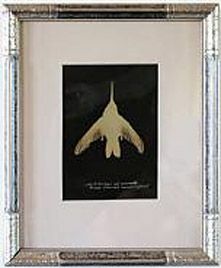 All of the smaller pieces are presented in vintage frames. Kate Beakey has a new book titled Painted Light that will be out in October. In 2012, an entire Photogram book will be published. The studio hanging of the Photograms are still available for viewing. 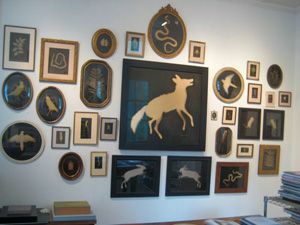 The gallery is located at the corner of 6th and Baylor, hours are Tues –Saturday 10-4 and by appointment.